R.I.P. Draft Station, and Sandia Chile Grill, too? It appears that two more local beer spots have closed their doors. One is now confirmed, the other seems likely but is not official. First up, Draft Station ABQ posted on Facebook that they were closing again due to problems caused by the Albuquerque Rapid Transit project on May 5. Since then, there were no posts, and multiple people told us that the taproom appeared to be permanently closed. We were then told by another brewery that their orders for future beers have been canceled. A final confirmation then came in when we contacted an executive with parent company Santa Fe Dining, and he emailed us back to confirm that yes, Draft Station ABQ is now permanently closed. It was always a tough sell for the local version of the big hit up in Santa Fe. While that location is in prime real estate overlooking the Plaza, the ABQ location was stuck too far from the other downtown breweries/taprooms and then just a bit too far from Old Town. Throw in the impact of A.R.T. on business (you could not turn into the parking lot from westbound Central), and it proved to be the final coup de grace. There is always the chance that Draft Station could live again (scroll down), but for now, may it rest in peace. Meanwhile, as I posted in The Week Ahead in Beer (no worries if you missed it), by all accounts Sandia Chile Grill is closed as well. Efforts to reach them by phone have failed as the number listed has been disconnected. They have not made a social media update in some time, but then again they never were very active online. A quick drive past the location found the doors closed, but the signs were still up, including their new T-shirts in the window. The tables and chairs were still inside as well. However, we checked the State of New Mexico website and found that their small brewer license is listed as expired. There are no applications pending for a new or renewed license under either Sandia Chile Grill or Oso Loco Brewery. If anyone out there knows the full story with SCG, please contact us. Meanwhile, there are three new small brewer licenses pending. The Sandbar Brewery and Grill will indeed be making its own beer in the location at 4100 San Mateo. For those thinking, “hey, that location is familiar,” it was formerly home to Sneakerz, a sports bar probably best known for having (you guessed it) sand volleyball courts on the premises. UPDATE: We previously wrote — The prior location of the Sandbar was up near Journal Center. Many, many moons ago we reported on how they were teaming up with the long-since-defunct New Mexico Craft Brewing out of Las Vegas to serve their beer at the indoor sand volleyball facility. That partnership did not last, but we are glad to see the Sandbar owner(s) sticking with craft beer. — But, as it turns out, this Sandbar has no relationship to the previous Sandbar. Our apologies for the mistake. The stated goal of Sandbar is to open this summer. We will keep everyone updated as to their progress. Another new name on the list is Toltec Brewing, which has a zip code listing of 87114. That is the West Side, running from the river to Albuquerque’s western city limits. The northern boundary is Rio Rancho, the southern boundary is roughly Paseo del Norte. Currently, Marble Westside and Boxing Bear are in this zip code, so clearly Toltec could be just about anywhere out there that commercial properties exist. There is no additional information online that we could find, social media or otherwise. If anyone out there knows more about Toltec, please drop us a line. The final newcomer is another place we knew about in advance. Guadalupe Mountain Brewing is set to become the second operational brewery in Carlsbad. We have already been in touch with their owner/brewer, so expect a story from us in the coming months. You can already follow them on Facebook. A reader alerted us to the fact that the developers of the Snow Heights Promenade are planning on adding a 2,800-square-foot taproom to the complex located on the southwest corner of Eubank and Menaul. All right, let us play the guessing game. We can rule out just about any brewery that has opened since the start of 2016, since none of them are really in position financially to open a taproom yet. We can then throw out any brewery that has maxed out its number of taprooms (Bosque), has a taproom somewhat nearby (Marble, Canteen), or a forthcoming taproom nearby (Red Door, Tractor). Taking the award-winning comment above, we gotta figure it is a brewery that has won multiple major medals/awards, which to the general public usually starts with the Great American Beer Festival. So who does that leave? Boxing Bear: The reigning GABF Mid-Size Brewpub of the Year is a logical candidate. The taproom would certainly bring their beers to a new audience. This one almost makes too much sense, doesn’t it? Still, nothing official yet from the BBB staff. Chama River: If the Draft Station is truly closed, maybe it is due to moving here. Technically, it was always under Chama’s license, so that could work. But, then again, it would not come with the name of the award-winning brewery attached. La Cumbre: Well, now, wouldn’t that be interesting? It’s pretty far from the main brewery, though certainly not as far as Boxing Bear. Owner Jeff Erway has talked in the past about the reasons he has not opened a taproom, ranging from not wanting a location too close to a bar or restaurant that has carried LC beers since the beginning, to wanting a good landlord tenant relationship (if not outright ownership of the taproom building). We will call LC the dark horse candidate. Could it be another brewery besides these? Sure, anything is possible, but these are the most logical candidates. Good ahead and speculate away in the comments or on social media. We will see what the final is when the developers and brewery in question are ready to announce it to the public. These are all the other breweries or off-site taprooms with pending licenses with the state. Bare Bones Brewing is closing in on a new location after their original space fell through in Cedar Crest. It will still be somewhere along Highway 14 in the East Mountains. Bombs Away Beer Company is busy with the buildout of their space near Central and Moon. We await a chance to visit when they are ready, so yes, we are in contact with head brewer David Kimbell. Drylands Brewing continues with its buildout in Lovington. Search for their Instagram page and you can keep track of their progress. It is looking good. Hops Brewery in Nob Hill remains in limbo. We have no idea what the current delay is about. Lava Rock Brewing continues with its buildout on Unser north of Ladera, as does Truth or Consequences Brewing down south. The latter now has an active license, but is not yet open. We have nothing new to add on Glencoe Distillery and Brewery in Ruidoso (license active, but no other info), Switchback Brewery in Cloudcroft, or Tumbleroot Brewery and Distillery in Santa Fe. If anyone out there has info, as always, please contact us. That is all from us for now. Got a tip? Want to share something without announcing it to the world? Direct message us on Facebook, Twitter, Instagram, or via email at nmdarksidebrewcrew@gmail.com. There are some tough choices to make on the beer front this Tuesday. Now that the holiday has come and gone, things are starting to rev up again. From a competition, of a sort, between two breweries, to lots of new food-and-beer pairings, more samplings/tastings, a beer dinner, and an educational class on off flavors, the afternoon and evening are packed with lots of fun. Good luck picking out which events you want to attend. What: Battle of the Breweries. Where: The Grain Station. When: 6 p.m. Cost: No entry fee. Details: It’s a Kill the Keg competition between Santa Fe’s Freestyle Pilsner and Upslope’s Craft Lager. Whichever beer runs out first, that brewery is the victor. There will some swag on hand and you can chat with SFBC and Upslope reps. Plus, of course, The Grain Station’s awesome menu of delectable food will be available. Why you should go: We can’t really let a Colorado brewery defeat a New Mexico brewery on our turf, right? What: Beer & Cheese Pairings with Cheesy Street. Where: Tractor Wells Park. When: 3 p.m. Cost: TBA. Details: The folks at Cheesy Street food truck will have trays of grilled cheese slideres, each paired up with a specific selection of Tractor beers. What those are were a mystery at press time, so go find out and let us know if they are as tasty as we expect them to be. Why you should go: Dude, grilled cheese and beer. It’s so American it’s scary. What: Japanese Beer Tasting. Where: Jubilation. When: 4 p.m. Cost: No entry fee. Details: Jubilation will have beers from Hitachino, Coedo, and Miyazaki Hideji for everyone to sample. Why you should go: It’s no longer all about Sake in Japan these days, see what they have to offer. What: New Belgium Lips of Faith One Off Tasting. Where: Two Fools Tavern. When: 4 p.m. Cost: No entry fee. Details: Oscar Worthy Coffee Barrel is the beer of choice today, and it will be served on nitro. There will also be additional NB beers on special. Why you should go: Sometimes you just have to see if a beer is worthy of its name. This is one of those times. What: Beer and Food Pairing. Where: Sandia Chile Grill. When: 5 to 8 p.m. Cost: TBA. Details: SCG will serve up some smoked brisket with their Red Ranger Irish Red. Why you should go: Beer and food for hungry/thirsty residents of the Northeast Heights. What: Lagunitas Special Tapping. Where: Nob Hill Bar & Grill. When: 5 p.m. Cost: No entry fee. Details: From the One Hitter Series comes GravensTime Apple-esque Beer, one of those grand rarities that must be tried. Why you should go: It’s the 2015 vintage, so go check it out before it’s gone forever. What: Tuesday Brewsday Marble Special Tapping. Where: Rock & Brews. When: 5 p.m. Cost: No entry fee. Details: Marble is bringing Saison #1 to tap once again. Why you should go: For all you in the Heights, this is your chance to experience this new creation from Marble. What: Beer & Taco Night. Where: Rio Bravo. When: 5:30 p.m. Cost: No entry. Details: Order tacos from the Taco Lady for $1 and wash them down with $5 flights of Pilsner, Sommer, DRB, and Red. Why you should go: Next to pizza, tacos may be our favorite food to pair with beer. What: Ballast Point Special Tapping and Pairing. Where: Canvas Artistry, 3120 Central Ave. SE. When: 6 p.m. Cost: TBA. Details: We are working on getting details about this event. Why you should go: TBA. What: The Good, the Bad, and the Ugly of Beer. Where: Albuquerque Brewing. When: 6 p.m. Cost: TBA. Details: Brewer John “Carnie” Bevz will host a tasting/sampling even to discuss off flavors and more that makes your beer good or bad. Why you should go: Get an education while enjoying some beer. What: Chef’s Pairing. Where: Ponderosa. When: 7 p.m. Cost: $45 per person ($40 mug club members). Details: Brewer Bob Haggerty and executive chef Knoulan Tanner are teaming up for their first beer dinner featuring Sour Saison paired with a charcuterie plate, Crosscut Kolsch paired with scallop salad, Red Rye Lager paired with a wild mushroom risotto with braised lamb, and Chocolate Stout paired with a pot de creme. Why you should go: Hopefully you signed up, because the deadline was Saturday. Call Ponderosa at (505) 639-5941 to see if there are any late openings. The Week Ahead in Beer: Ring in the New Beer, er, Year! Now that we all (hopefully) survived blizzard-palooza 2015, one of those great (or stupid) drinking holidays is upon us. Yup, for better or worse, it is New Year’s Eve time again. So get ready to mumble along to that one song everyone can’t really sing but tries to sing anyway. Cash in that designated driver card, or prepare to Uber, or heck, tell your friend you are bringing a sleeping bag along. Just make sure you are bringing a growler or some excellent bombers/sixers if you’re gonna do that. If you are not doing the house party thing, a few of our breweries will be hosting some festivities. As we mentioned the other day, Kaktus is opening their Nob Hill taproom with a party starting at 7 p.m. and running until midnight. They will also have a party for their Bernalillo patrons at the brewery running the same hours. Other places hosting live music and/or special events include Distillery 365, Lizard Tail, Nicky V’s Pizzeria/Pi Brewing, Rio Bravo, and Tractor Wells Park. Outside of ABQ, there will be music and other goings on at Bathtub Row in Los Alamos and Twisted Chile in Socorro. See each brewery’s individual entry below for more details. For those breweries who provided it, here are their hours, if different from normal, for New Year’s Eve and Day. Boese Brothers will stay open past midnight Thursday, with normal hours Friday. Bosque will close their San Mateo location at 5 p.m., so hurry over to fill your growlers or to pick up a bomber or two. Boxing Bear is also closing early Thurssday, at 6 p.m., and will open at noon on Friday. La Cumbre closes at 8 p.m. Thursday and will be closed all day and night Friday. Marble has last call at 8:30 p.m. and shuts their doors at 9. They will then have a New Year’s Day party (see their entry below). Nicky V’s/Pi will host a “New York New Year’s,” meaning they close at 10 p.m. (midnight NYC time). Turtle Mountain could close at any time after 6 p.m., it will be at the discretion of their manager on duty. Normal hours resume Friday. Up in Santa Fe, Second Street will be closed Friday. Down in Socorro, Twisted Chile closes at 10 p.m. both nights. When/if we get the others, we will keep updating this story. On a separate note, don’t forget to vote for the best beer name of 2015. The poll will be open through Monday. Pink Elephants on Parade was in the lead Tuesday night, followed by Baby Got Bock and Hoppenheimer IPA. It is, once again, an understandably light week for new beers. The most excellent Scale Tipper IPL is available at all three Bosque locations. It’s Not EVEN Brown will confound your senses at La Cumbre. Marble has resurrected White Out in honor of the recent snow. Turtle Mountain is feeling summery in the dead of winter with All Peached Up. Down in Socorro, Twisted Chile has McFadden’s Scotch Ale and Twisted Black IPA back on tap. Continue reading for all the news that is fit to blog for the week of December 28. Beers: Patriot Porter, La Onza White Ale, Old Shonie Scottish Ale, Dr. Strangehop XPA, Duke City Lager, Burly Brown, Barrel-Aged Porter. The Patriot Porter (6% ABV) is a pre-Prohibition style of American porter, more brown than black with strong roasted flavors smoothed out by the nitro pour. La Onza (5.4% ABV) offers up a big, citrusy kick for a Belgian-style witbier. Old Shonie (4.5% ABV) is also available on nitro; it is lighter than most of the other Scottish beers in the ABQ area. The Dr. Strangehop XPA (6.5% ABV) offers up a wonderful mix of the piney Willamette and more floral Mosaic hops. The Duke City Lager (5% ABV) is now a permanent addition to the lineup. Ichabod’s Revenge (7.6% ABV) is a pumpkin ale made with a ton of real pumpkin baked by the staff. The Burly Brown (6.8% ABV, 72 IBU) is an India Brown/Cascadian style. They are down to the very last of their supply, so hurry over before it runs out. The Barrel-Aged Porter is on tap for a limited time. Beers: Jared’s Belgian Quad with cherries, Eldorado Pale Ale, Imperial Coffee Brown, Scale Tipper IPL, Dry Stout (on nitro at all locations, CO2 at Las Cruces only), Jingle Bell Bock (Nob Hill only), Citra S.M.A.S.H. (Las Cruces and San Mateo). All three Bosque locations are now up to date. The new Belgian ale series is underway with the decadent Jared’s Quad with cherries (10.3% ABV, 25 IBU). The Eldorado Pale Ale (6.4% ABV, 30 IBU) is a delicious, single-hop pale. The new Jingle Bell Bock (6.9% ABV, 20 IBU) is a sweet treat. The Imperial Coffee Brown (9% ABV, 20 IBU) is also for sale in bombers; we highly, highly recommend you pick up this one before it’s gone. You can still buy bombers of the barrel-aged Jet Black Winter (10.2% ABV) until the supply runs out. The newest additions are the Dry Stout (4.5% ABV, 20 IBU) and Scale Tipper IPL (6.1% ABV, 95 IBU), which is a lager using the Scale Tipper hops. The Citra S.M.A.S.H. is also now popping up at the different locations as tap space becomes available. Beers: Body Slam Imperial Pilsner, Fist Pump Pumpkin Ale, Chocolate Milk Stout, Bear-El Aged Stout, Crystal S.M.A.S.H., Iron Lung Smoked Porter. Boxing Bear got into the barrel-aging game by taking some Standing 8 Stout and putting it in Pinot Noir barrels. Go try this rather different take on a barrel-aged offering while it lasts. The appropriately smoky Iron Lung is back for another run. The Chocolate Milk Stout (5.2% ABV, 20 IBU), a silver medal winner at GABF this fall, is still available for a limited time. You can expect it to go fast, again, so head over ASAP. Is also available on nitro while supplies last, plus now they have bottled it and bombers are for sale at the brewery and at Jubilation. Other available seasonals include the Fist Pump (5.4% ABV, 20 IBU) and Body Slam (7.4% ABV, 60 IBU). Beers: Irish Red, Cherry Blossom Wheat, Galaxy IPA, Aumbers Amber, Sweet Sandarine Porter, Schwarzbier, Black Hops IPA, Panama Joe Coffee Stout. The Porter, Schwarzbier, Black Hops, and Panama Joe are all part of this year’s edition of Solstice Blackout. Get a sample tray of all five for $5 or you can purchase individual pints. The Crew visited recently and we all declared this batch of Panama Joe just as good as the one that medaled at the Great American Beer Festival in 2014. The Galaxy IPA (7.2% ABV, 80 IBU) will take you out of this world. The Cherry Blossom Wheat (4% ABV, 10 IBU) was made with 100-percent tart cherry puree, and it offers a nice break from the heavier beers on tap. The Aumbers (6.5% ABV, 45 IBU) offers up more of a kick than most ambers. 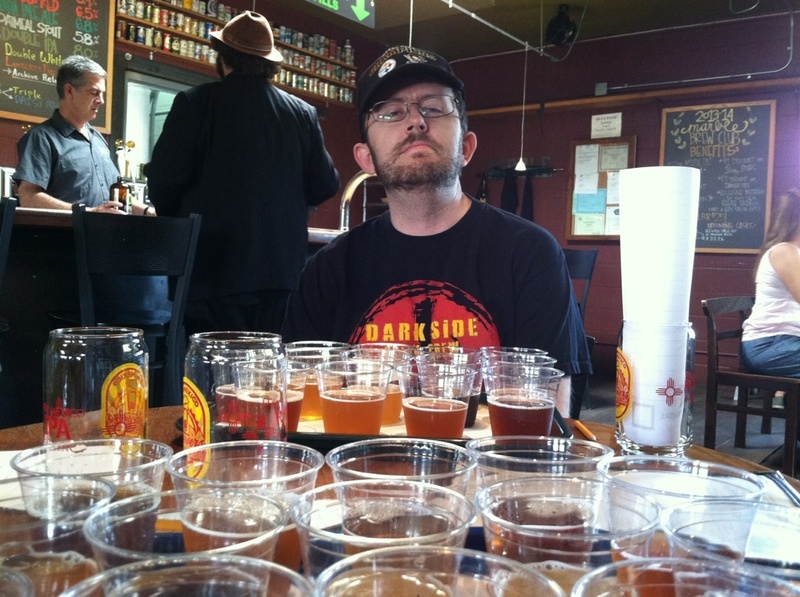 Beers: 365 ESB, 4th of July American Ale, Lone Pine Pilsner, Faulty Barrel-Aged Ale. Distillery 365 is located at 2921 Stanford Dr., just south of Candelaria and not far from La Cumbre and Canteen. The most recent addition is the Faulty, which was aged for several months in red wine barrels. The 4th of July is their first beer to highlight the native Neomexicanus hops. It is a highly aromatic strong ale with very little bitterness. The ESB a simple English ale. This second batch offers up more flavor from the hops and malts. The Lone Pine has been on tap for a while, sorry we are just remembering to add it here now. They are also serving their house-made Holy Ghost Vodka and Horsethief Rum, a 100-percent molasses-based silver rum, plus guest taps from Red Door. Distillery 365 will host live music for New Year’s Eve with Eryn Bent and Quietly Kept. It all kicks off at 8 p.m. Beers: Dunkel, 1492 IPA, Smoke and Fire Porter, ESB, Coffee-roasted Schwarz Bier, Helles Lager, Peppermint Stout, Red Ale. The most recent additions are the Schwarz Bier, made with local coffee, plus the annual holiday favorite, Peppermint Stout. Before that came the Red Ale, Dunkel, and ESB, a longtime Crew favorite at Kaktus. Other seasonals available are the 1492 IPA (made with Columbus hops, natch), Smoke and Fire Porter (a cherrywood smoked porter with Chipotle), and Helles Lager. Kaktus is located at 471 South Hill Road in Bernalillo, for those who have still not made the trek. Kaktus has brewed up their first imperial stout. Look for it soon. Events: The Desert Darlings belly dancers perform from 6 to 8 p.m. on almost every Sunday. If you’ve never seen the Desert Darlings in person, you’re missing out. They will be taking the holidays off, so we will let you know when their shows resume. Kaktus will have live music and more at both of their locations starting at 7 p.m. Thursday. See our intro for more info. Beers: Ryeot on Rye, La Negra, Gracias Por Fumar (on nitro), Grange’s Session IPA, It’s Not EVEN Brown. All the beers that came out for La Cumbre’s recent 5th anniversary week are still available. The most recent addition is It’s Not EVEN Brown, a brown ale that looks red and tastes like something wholly different. The Ryeot on Rye is an amped-up, barrel-aged version of their popular Red Ryeot. La Negra is a big, thick, imperial stout. Gracias Por Fumar is a smoked porter that goes oh so well on nitro. Before that came the Grange’s Session IPA, with $1 from every pint sold going to the fight against ALS. For a session, this thing has a hell of a hop kick. It’s La Cumbre, though, so should we really expect any less? Events: Sweet Spot performs on Saturday from 7 to 10 p.m. Yoga is back at the taproom every Sunday at 10:45 a.m. Beers: Both locations — Tall, Dark, and Pumpkin, Reserve Ale, Imperial Red; Downtown only — Double IPA, White Out; Westside only — Hey Porter. Head over to either Marble location fast before the Tall, Dark, and Pumpkin (6.2% ABV) runs out. The TDP is a brown ale with pumpkin spice and vanilla, served on nitro. Also available at both locations is the delectable Hey Porter (5.9% ABV). Two heavyweights, the Reserve and Imperial Red, are back on tap. White Out (9% ABV), which was originally brewed for Marble’s seventh anniversary back in April, is now back on tap for a limited time. On the live music front, Lenin & McCarthy will take the indoor stage tonight (Wednesday) from 6 to 9 p.m. This Friday will mark a special New Year’s Day Party, featuring the release of a “mysterious, barrel-aged offering.” There will be live music with Buffalo Gals from 2 to 3 p.m., Saltine Ramblers from 4 to 5:30 p.m., and Next 3 Miles from 6 to 8 p.m.
Events: Live music is back tonight (Wednesday) with David Webb from 7 p.m. to 9 p.m. The Draft Sessions open mic is just about every Monday from 7 to 9. Events: Live music is back this week with a doubleheader on New Year’s Eve. Clark Andrew Libbey performs at 4 p.m., followed by Given Time at 6 p.m. Scotty & the Atomics follow Saturday at 6 p.m. Beers: Berliner Weisse, Dark Horse Lager, Desert Dweller IPA, Barn Burner Pale Ale, Pear Berry Cider, Tupac Cali Red, Barnstorm Ale, Luna De Los Muertos (Wells Park only), Et Tu Brute Cider (Wells Park only), Scotcholate Scotch Ale (Wells Park only), Lil Cease Session IPA (Nob Hill only), The Ruggles (Nob hill only), Turkey Drool (Nob Hill only). The newest additions are the Et Tu Brute Cider and Scotcholate Scotch Ale (at Wells Park only) and the Luna De Los Muertos (8.5% ABV), Tupac Cali Red (6.5% ABV, 80 IBU), and Barnstorm Ale at both locations. Before that came the Turkey Drool (8.3% ABV, 30 IBU), Desert Dweller (6% ABV), and Lil’ Cease Session IPA (4.5% ABV, 79 IBU). This year’s Turkey Drool might be the best yet, a perfectly balanced blend of amazing flavors, sweet, smooth, and spicy all in one glass. It is nearly out at Nob Hill, with Luna ready to replace it, so hurry over. Still hanging around are the Dark Horse Lager (5.6% ABV) and Summer Ale (7% ABV). The Ruggles (4.4% ABV) is a California Common-style beer. Berliner Weisse (5.1% ABV) is still available at both locations. Events: Flo Fader will be spinning at Wells Park on New Year’s Eve starting at 8 p.m. The In the Mix Series is back Saturday at Wells Park with DJ Soiree spinning at 9 p.m.
Sunday features the premier of the pilot episode of the new TV series “Bordertown” at Wells Park, starting at 8 p.m.
Also, every first Monday of the month at both Tractor locations is Beer for a Better Burque night. For every pint you buy $1 can go to one of four charities that have partnered with Tractor. You can also opt to purchase a special growler with the logo of your favorite charity. So, yes, that will be this Monday. Beers: Altbier, All Peached Up, Challenger Deep Black IPA, O Tannenbaum. The Gourd Dammit finally kicked, so All Peached Up will take its place. A peachy wheat ale, this beer will help you think of the warmer days ahead. TMBC’s winter warmer, O Tannenbaum (5.6% ABV, 24 IBU) is also on tap. It was brewed with fresh ginger and spruce tips. The most recent additions before that were the Challenger and Altbier. Beers: Russian Imperial Stout, Bock Door Man, Stranger Than Fiction, McLeonard’s Single Malt Scotch Ale. The most recent additions are the Stranger Than Fiction, a Belgian-style IPA, the Bock Door Man (6.4% ABV), and the always beefy Russian Imperial (10% ABV). The McLeonard’s is a big old Scotch in the style of a Wee Heavy. News: Brewer James Warren said he has a Belgian Quad and Blonde due up soon, plus a Barleywine. Beers: Kolsch, IPA, Cream Stout, Rod’s Best Bitter, International Style Pale Ale, Kidder Special Bitter, Festivus, Vienna Country Lager, 2015 Anniversary ESB. The most recent addition is the new Vienna Country Lager. The special ESB was brewed for the recent 19th anniversary party. Other recent additions to the lineup are Festivus, a special holiday ale, and old favorites Kidder and Rod’s Best Bitter. The Pivotal IPA and Boneshaker Bitter are often available for purchase in four-packs of cans. Events: New Year’s Eve will feature a musical doubleheader at the original location. Welsh and Watts perform from 7 to 9 p.m., followed by 50 Watt Whale ringing in the new year. Blues Revue Band will perform Saturday. The Swing Ornament will perform at the Railyard location Saturday. Events: There will be live music on New Year’s Eve. Mose McCormack kicks things off at 7 p.m., followed by Dave, Ben & Val Thomas. It all wraps up at 10 p.m. The Week Ahead in Beer: Stock up on brews, a blizzard is a comin’! By all accounts of the weather folk on our esteemed local TV stations, this weekend is gonna feature a whopper of a storm that will likely have us all stuck at home in the warm embrace of our families. In other words, STOCK UP ON BEER NOW! Head on over to Jubilation today (Wednesday) from 9 a.m. to 9 p.m., or Thursday from 9 a.m. to 6 p.m. After that, you’re outta luck, since they’re gonna be closed Christmas Day and the day after. As for our breweries, for growler and/or package purchasing (remember, you can still buy brewery merchandise and/or memberships, too), we have holiday hours for some of them. We asked all, but only a few responded. Keep checking their Facebook pages. All will be closed Christmas Day, we do know that. As for Christmas Eve, here are some of the closing times that we have so far. UPDATE: Boese Brothers will be closed Thursday, open Saturday. Sorry, had that backwards earlier. Get your growlers filled for just $6 today. UPDATE: All Bosque locations will close at 5 p.m.
UPDATE: Kaktus closes at 7 p.m. They will have $3 pints and food specials. La Cumbre closes at 5 p.m.
Rio Bravo closes at 6 p.m.
Down in Socorro, Twisted Chile closes at 6 p.m.
Oh, yes, and a Merry Christmas from all of us in the Crew. Thanks for reading, commenting, and interacting with us online or in person over the course of this year. It is an understandably light week for new beers. Bosque has a Dry Stout at both ABQ locations. The Iron Lung Smoked Porter is back at Boxing Bear. Canteen’s Solstice Blackout means there will now be Sweet Sandarine Porter, Schwarzbier, Black Hops IPA, and Panama Joe Coffee Stout on tap, either as part of the sampler, or separately in pints. Chama River has more Sun Dog Kolsch available. There will be a release party today for Salted Caramel Stout at Nexus. Tractor released Luna De Los Muertos Russian Imperial Stout back on Monday. Up in Santa Fe, Second Street has their holiday ale, Festivus, on tap, along with a fresh batch of Rod’s Best Bitter. Oh, and we would also recommend stopping by Nob Hill Bar & Grill tonight after 6 p.m. to say farewell in person to bar manager Thomas DeCaro, who is leaving for a position with Ballast Point. Before departing, he is hosting an Avery tap takeover with Raja DIPA, Liliko’i, and the new Vanilla Bean Stout. Continue reading for all the news that is fit to blog for the week of December 21. Beers: Humo Rojo, Olde Bosky Porter, Belgian Blonde, Jared’s Belgian Quad with cherries, Eldorado Pale Ale, Dry Stout (Nob Hill and San Mateo), Jingle Bell Bock (Nob Hill only), Imperial Coffee Brown (on nitro). All three Bosque locations are now up to date. The new Belgian ale series is underway with the Belgian Blonde (7.3% ABV, 24 IBU), plus the Jared’s Quad with cherries. An old favorite has returned in the Olde Bosky Porter (6% ABV, 27 IBU), an original member of the lineup that cries out for a return to your bellies. Still available is the Humo Rojo (5.6% ABV, 16 IBU), a smoked red ale. The Eldorado Pale Ale is a delicious, single-hop pale. The new Jingle Bell Bock is a sweet treat. The Imperial Coffee Brown is also for sale in bombers; we highly, highly recommend you pick up this one before it’s gone. You can still buy bombers of the barrel-aged Jet Black Winter (10.2% ABV) until the supply runs out. The newest addition is the Dry Stout (4.5% ABV, 20 IBU). Beers: Noble Pale Ale, Body Slam Imperial Pilsner, Fist Pump Pumpkin Ale, Chocolate Milk Stout, Bear-El Aged Stout, Crystal S.M.A.S.H., Iron Lung Smoked Porter. Boxing Bear got into the barrel-aging game by taking some Standing 8 Stout and putting it in Pinot Noir barrels. Go try this rather different take on a barrel-aged offering while it lasts. The appropriately smoky Iron Lung is back for another run. The Chocolate Milk Stout (5.2% ABV, 20 IBU), a silver medal winner at GABF this fall, is still available for a limited time. You can expect it to go fast, again, so head over ASAP. Is also available on nitro while supplies last, plus now they have bottled it and bombers are for sale at the brewery and at Jubilation. Other available seasonals include the Fist Pump (5.4% ABV, 20 IBU), Noble PA (5.8% ABV, 30 IBU), and Body Slam (7.4% ABV, 60 IBU). Events: Geeks Who Drink will now be held every Wednesday from 8 to 10 p.m. at Boxing Bear, except this week. Tonight they are closing early for a Christmas party for the staff. GWD will resume on Dec. 30. Beers: Irish Red, Cherry Blossom Wheat, Galaxy IPA, Aumbers Amber, Sweet Sandarine Porter, Schwarzbier, Black Hops IPA, Panama Joe Coffee Stout. The Porter, Schwarzbier, Black Hops, and Panama Joe are all part of this year’s edition of Solstice Blackout. Get a sample tray of all five for $5 or you can purchase individual pints. The Galaxy IPA (7.2% ABV, 80 IBU) will take you out of this world. The Cherry Blossom Wheat (4% ABV, 10 IBU) was made with 100-percent tart cherry puree, and it offers a nice break from the heavier beers on tap. The Aumbers (6.5% ABV, 45 IBU) offers up more of a kick than most ambers. Events: Live music is back this week with Keith Sanchez performing Sunday at 3 p.m., followed by the Fabulous MartiniTones on Tuesday at 6 p.m. Beers: Ryeot on Rye, La Negra, Gracias Por Fumar (on nitro), Grange’s Session IPA, Trou Noir. All the beers that came out for La Cumbre’s recent 5th anniversary week are still available. The Ryeot on Rye is an amped-up, barrel-aged version of their popular Red Ryeot. La Negra is a big, thick, imperial stout. Gracias Por Fumar is a smoked porter that goes oh so well on nitro. Before that came the Trou Noir (7.5% ABV, 35 IBU), a Belgian dark strong, and the Grange’s Session IPA, with $1 from every pint sold going to the fight against ALS. For a session, this thing has a hell of a hop kick. It’s La Cumbre, though, so should we really expect any less? Events: Moonhat performs on Saturday from 7 to 10 p.m. Yoga is back at the taproom every Sunday at 10:45 a.m. Beers: Both locations — Tall, Dark, and Pumpkin, Hey Porter, Reserve Ale, Imperial Red; Downtown only — Double IPA; Westside only — none. Head over to either Marble location fast before the Tall, Dark, and Pumpkin (6.2% ABV) runs out. Remember how fast the last two Marble pumpkin ales went? Exactly. The TDP is a brown ale with pumpkin spice and vanilla, served on nitro. Also available at both locations is the delectable Hey Porter (5.9% ABV). Two heavyweights, the Reserve and Imperial Red, are back on tap. All beers are available at both locations for the time being. Marble will have a tap takeover at Rock & Brews tonight (Wednesday) on Montgomery just west of San Mateo. On the live music front, Ruben Montoya will take the indoor stage Saturday from 6 to 9 p.m. Beers: Equinox, Hoppy Wheat, U.S.S. Simcoe, Salted Caramel Stout. Today (Wednesday) will mark the release part for the Salted Caramel Stout. Come on down anytime after 4 p.m. for this holiday treat. The U.S.S. Simcoe (7% ABV, 30 IBU) is the latest pale ale in Nexus’ S.M.A.S.H. (single malt and single hop) series, and it is a tasty one. Equinox (6.5% ABV, 16 IBU) is back for another run of pumpkin-spiced brown ale goodness. This year’s version wowed us all at NM Brew Fest. The Hoppy Wheat is a seasonal hopped-up wheat beer, as if you could not guess by the name. Beers: (Regular) Gateway Blonde Ale, Roamer Red, Threshold IPA, Paint it Black Milk Stout, Unhinged Cider, Trapdoor Belgian Wit. (Seasonal) Cosmos Porter, Ryeson Sun Saison, Anniversary Double Red, Dark Side DIPA. No, they did not name the Dark Side DIPA (10.3% ABV, 100+ IBU) after us, but we still went and drank some of this mosh pit of piney hops. Another recent addition is the delicious, slightly hoppy Cosmos Porter. Before that came the Anniversary Double Red (7.7% ABV, 67 IBU), which has a deceptively low IBU count for a beer this hoppy. It’s got bite, it’s dry, it’s fierce, it’s right up there with the other best imperial reds in town. The Ryeson is still the only rye saison we have ever tasted. Events: Live music is back tonight (Wednesday) with Todd Tijerina from 7 p.m. to 9 p.m. The Draft Sessions open mic is just about every Monday from 7 to 9. Events: There will be live music back at Rio Bravo next week. UPDATED >>> Beers: Berliner Weisse, Dark Horse Lager, Desert Dweller IPA, Barn Burner Pale Ale, Pear Berry Cider, Tupac Cali Red, Barnstorm Ale, Luna De Los Muertos (Wells Park only), Et Tu Brute Cider (Wells Park only), Scotcholate Scotch Ale (Wells Park only), Lil Cease Session IPA (Nob Hill only), The Ruggles (Nob hill only), Turkey Drool (Nob Hill only). The newest additions are the Et Tu Brute Cider and Scotcholate Scotch Ale (at Wells Park only) and the Luna De Los Muertos (8.5% ABV), Tupac Cali Red (6.5% ABV, 80 IBU), and Barnstorm Ale at both locations. Before that came the Turkey Drool (8.3% ABV, 30 IBU), Desert Dweller (6% ABV), and Lil’ Cease Session IPA (4.5% ABV, 79 IBU). This year’s Turkey Drool might be the best yet, a perfectly balanced blend of amazing flavors, sweet, smooth, and spicy all in one glass. It is nearly out at Nob Hill, with Luna ready to replace it, so hurry over. Still hanging around are the Dark Horse Lager (5.6% ABV) and Summer Ale (7% ABV). The Ruggles (4.4% ABV) is a California Common-style beer. Berliner Weisse (5.1% ABV) is still available at both locations. Events: Kamikaze Karaoke is back tonight (Wednesday) at Wells Park starting at 8 p.m. Or you can head up to Nob Hill for the Heavenly Hosts Christmas Carolers at 7 p.m.
Saturday will feature the In the Mix series with DJ Clout spinning at 9 p.m. at Wells Park. Eryn Bent’s Solo Album Release Party will be held at Wells Park on Sunday at 4 p.m. Beers: Altbier, Gourd Dammit, Challenger Deep Black IPA, O Tannenbaum. TMBC’s winter warmer, O Tannenbaum (5.6% ABV, 24 IBU) is now on tap. It was brewed with fresh ginger and spruce tips. The most recent additions before that were the Challenger, Altbier, and the Gourd Dammit, TMBC’s take on a pumpkin ale. Beers: Kolsch, IPA, Cream Stout, Rod’s Best Bitter, International Style Pale Ale, Kidder Special Bitter, Festivus, 2015 Anniversary Ale, 2015 Anniversary ESB. Hurry over to try the two beers that were brewed up for the recent 19th anniversary party, a hoppy ale and an ESB. The St. George and Kidder are two old favorites back on tap. The newest additions to the lineup are Festivus, a special holiday ale, and old favorite Rod’s Best Bitter. The Pivotal IPA and Boneshaker Bitter are often available for purchase in four-packs of cans. Events: There will be live music on a Wednesday at the original location as the Kodama Trio performs the music from a “A Charlie Brown Christmas.” Then on Saturday, Jono Manson is at the original location and The Shiners Club will perform at the Railyard.